Mark Harris - Licensed to About.com, Inc.
Finding the exact music you want is so much easier when you have playlists. Without them, it can be time-consuming having to sort through your digital music library handpicking the songs and albums you need every time. If you've got a heap of songs on your iPad then you don't need to be tied down to your computer just to create playlists, you can do this directly in iOS. And, the next time you sync with your computer the playlists you created will be copied across. Tap the Music app on the iPad's home screen. Look at the bottom of the screen and tap the Playlists icon. This will switch you to playlist view mode. To create a new playlist, tap the + (plus) icon. This is located on the right-hand side opposite the New Playlist... option. A dialog box will pop-up asking you to enter a name for your playlist. Type a name for it in the text box and then tap Save. Now that you've created a blank playlist you'll want to populate it with some of the songs in your library. Select the playlist you just created by tapping on its name. Tap on the Edit option (near the left-hand side of the screen). You should now see a + (plus) appear on the right-hand side of your playlist name. Tap on this to start adding songs. 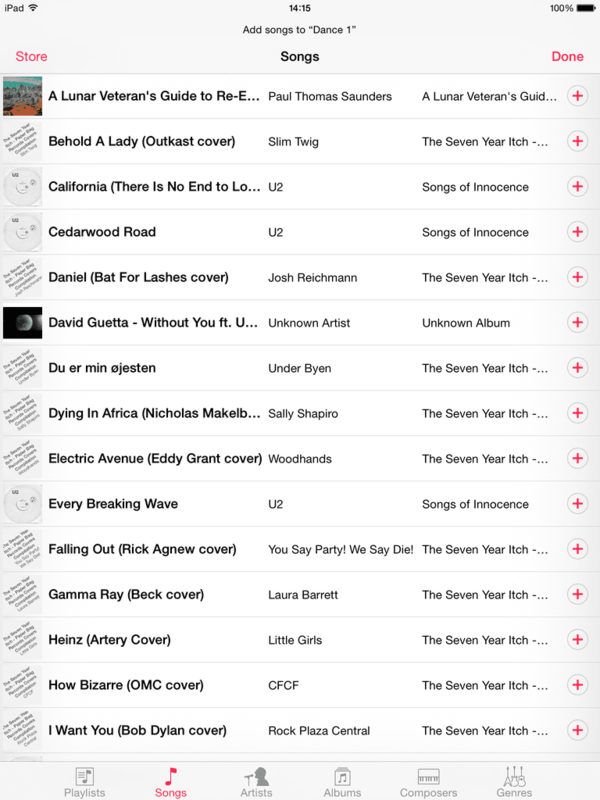 To add a mix of tracks, tap on Songs near the bottom of the screen. You can then add a song by tapping on the + (plus) next to each one. You'll notice when you do this that the red + (plus) will be grayed out — this shows that the track has been added to your playlist. When finished adding songs, tap the Done option near the top right-hand side of the screen. You should now be able to automatically switch back to the playlist with a list of tracks that have been added to it. Tap the playlist you want to modify and then tap Edit. You'll now see to the left of each song a - (minus) sign. Tapping on one will reveal a remove option. To delete the entry from the playlist, tap on the Remove button. Don't worry, this won't remove the song from your iTunes library. When you've finished removing tracks, tap the Done option. Tip: If you want to create a playlist based on an artist, album or genre, then it's much easier if you tap on a category first (near the bottom of the screen). Once you've done this you'll only see songs that are relevant.